This is the category of “daily beater” or the watch you like to wear most of the time – the watch that’s just part of you, it’s there to tell you the time, day and date maybe and forgotten on your wrist until you glance at it. And this is a difficult choice as my own ideas change with the weather! But nevertheless I have made a couple of choices. 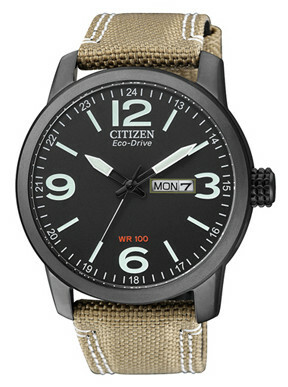 Based on a military concept this Eco-Drive Solar model keeps appearing in new and slightly altered disguises virtually every year and is still, in one form or other, a current offering from Citizen. Testament to it’s inherent good design and obvious that the basics are right. Water Resistance is 100m and the case size is approx’ 40mm including the Crown and really slim at 9mm depth. And being a very neat lug to lug size of just 42mm it will fit small wrists easily. Always remember Patek Philippe watches tend to be just 36/37mm and who wouldn’t wear one of these! And come on this one’s only £70 . . .
Eco-Drive Solar means no battery issues ever (an 18o day power reserve) stainless steel throughout including screw back. I got mine in 2008 and it’s been faultless ever since. The broad hands and numerals (complete with 24hr marks) are luminous blue and show reasonably well in the dark. It also has an orange and white tipped (luminous) center seconds pointer hand and a good sized Day and Date window @3 which I prefer rather than just Date. At my age it’s nice to be reminded what day it is, as after I retired one day’s much like another! Some versions have a bracelet, others straps and one I saw at some time ago at Timeshop4you – the BM8476-23EE has a textile strap, black coated stainless case and a cleaned up grey tone dial which makes it look very modern military. 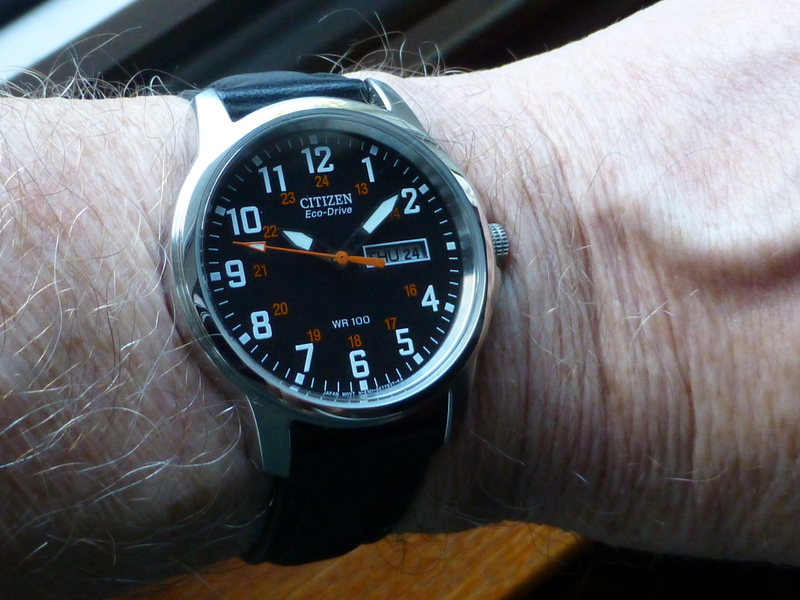 Slightly larger at 45mm inc crown x 11mm depth probably as a result of fashion change for larger watches. Accuracy wise it’s really good and as an example mine is maybe to a few seconds or so each month, so no complaints from me. Prices range from £70 to about £100 depending on variant. 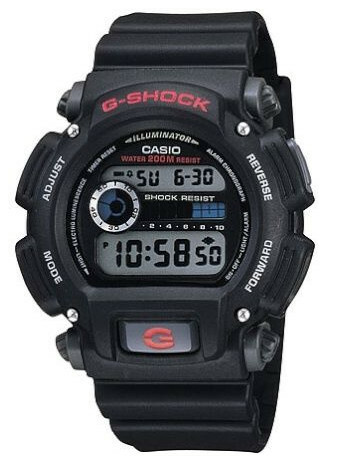 This model in my opinion is almost a hybrid for Casio, defying the logic of their more modern “large” format G-Shocks, this model is refreshingly compact at just 45mm diameter, which I for one am truly pleased about. For it makes this model a good contender for a decent “Daily Beater”. Good function set sets the tone here as it provides enough for the average guy without going over the top or adding in features that really are gimmicks at best and at worst dial clutter. The dial here is OK with basically two windows for data display. The upper one for indicators and Day, Date and Month and the lower one for the Time and Seconds. It also of course will display Chronograph, Countdown Timer and Alarms and so on and all at good size. The pushers on this case are much better than many on Casio models as they are large and easy to use and find – some models are so shrouded they are difficult to find or use without fumbling. And the excellent Illuminator back light is operated by a front mounted pusher in the style of Timex. The only downside for me is the odd Casio insistence for a custom bracelet which is not standard, so fitting alternative straps for instance is not easy if not impossible. Are after sales so important that this ploy has to be used? I wonder. However that said this is a great all round model with a 200m Water Resistance rating which is really excellent at this price and is well worthy of my Daily Beater choice, though whilst I did mention Timex earlier, they too have a few that could easily manage the same function and personal choice at the end of the day rules . . . Priced at under £50 in the UK so good value all round. Forgot to mention the back light – this is excellent with the Casio Illuminator luminescence technology they introduced in 1995. Fact – Timex actually introduced the first electro-luminescence for their watches 3 years earlier in 1992 (Indiglo) – but they are both similar and by far the best on the market today.